MEMORY TREE: Robert Duran hangs a note on the memory tree in the quad on Tuesday, April 30. Ten days after Delta College student Dominic Deiro died tragically in a solo-vehicle drunken driving accident, his family found a way to cope through education. In response to the December 23, 2011 accident that took his life, Deiro’s family founded the Dominic Designated Driver program in hopes of spreading awareness and deterring young people from drinking and driving. On April 30, the Deiro family brought that message to Delta College during an event in Upper Danner sponsored by the Cultural Awareness Programs Committee and produced by the English Department and DDD. Mia Deiro Douglass, Dominic’s sister, was the keynote speaker. She shared precious moments she has had with her brother, and the inspiration and optimism he carried throughout his life. The emphasis of having a sober driver, and drinking responsibly was the overall goal of the informative forum. Officer Craig Wood of the Stockton Police Department stressed the financial struggles and consequences drunk driving can have on individuals. Bobby Wells, a current University of the Pacific student and one of Dominic’s close friends, spoke about the importance of friendship and drinking responsibly. Wells was supposed to be in the car with Deiro that night. Rosie Huerta, a financial aid outreach specialist spoke about the memorial scholarship worth $200 offered by Delta and the DDD program. “We’re here to tell you this needs to be stopped,” said Huerta. Robert Duran, a member of the Hip Hop Congress performed a song titled “No drinking and driving,” which he himself has fallen victim to. Duran wrecked his car in a drunken driving accident in 2006. Duran received a brain injury as a result of the accident and had to have surgery. He learned first-hand about the dangers of drinking and driving. No other people were hurt in his accident. Patrica Cunningham, also a member of the Hip Hop Congress, performed a touching freestyle poem. Student Angela Bardot and English Instructor Paula Sheil, along with the Writer’s Guild, introduced a Memory Tree at the end of the event. 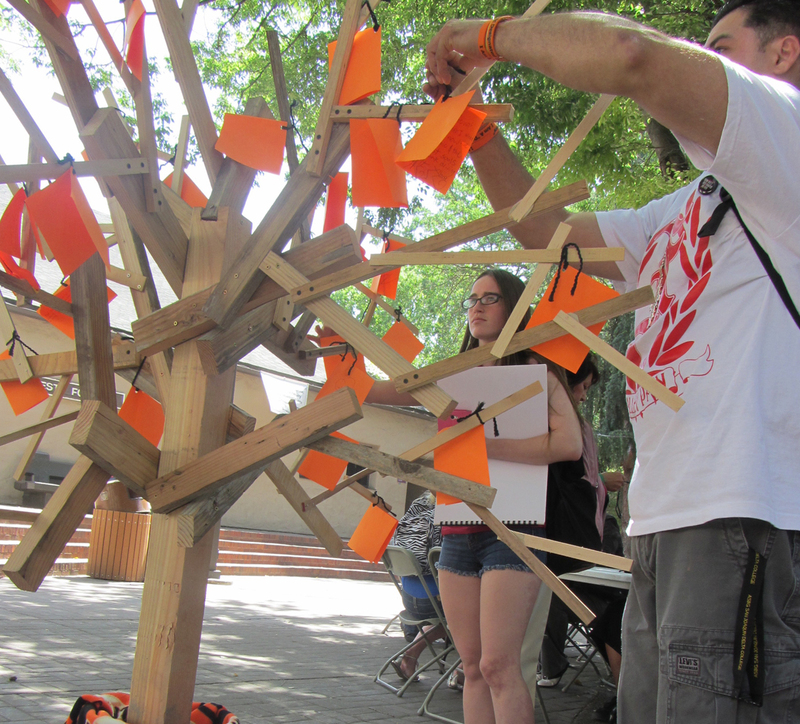 The Memory Tree is a way to pay tribute to those who have fallen victim to drunken driving accidents, along with honoring Dominic’s family’s commitment to him. The tree is laced in San Francisco Giants colors, which was Dominic Deiro’s favorite baseball team. It has found a permanent home in the Goleman Library. Mia Deiro Douglass closed with thanks to the contributors who helped put the event together, including special thanks to Robert Bini, a Delta English instructor who co-edits Delta Winds, a campus magazine where Dominic Deiro’s Dream Act essay was published. Deiro Douglass also wants to encourage students to post student writing on the DDD website and share their thoughts on the matter at hand. With support from more than 40 bars in the Stockton, Lodi and Modesto area, as well as Arizona, the family’s message is spreading far and wide. “We want to inspire all age groups to have a designated driver,” said Deiro Douglass.